❶ Describe in your own words what ?Fake News? is. ❸ What sources do you use for news? 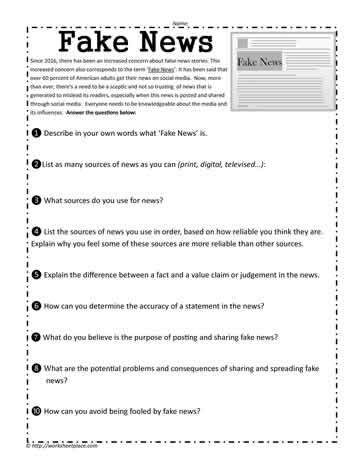 ❹ List the sources of news you use in order, based on how reliable you think they are. Explain why you feel some of these sources are more reliable than other sources. ❺ Explain the difference between a fact and a value claim or judgement in the news. ❻ How can you determine the accuracy of a statement in the news? ❼ What do you believe is the purpose of posting and sharing fake news? ❿ How can you avoid being fooled by fake news?